I was at my chorale rehearsal the other night and one of my fellow altos asked me if I was still painting. I didn’t know what to say, because I want to be painting, but I haven’t painted anything since before my big trip out West in September. I don’t know why I’m not painting. I’m just not painting. I am now officially way behind on my blog goal. I set the goal of painting fifty plein air paintings before my next birthday. I had to clean up my painting gear to make my house pretty for the big Thanksgiving gathering and that gave me a chance to count my paintings. I have done ten. Ten whole paintings, from February through November. That means I have to come up with forty between now and next February eighth. I haven’t counted the days between now and February eighth, but I know that a lot of them happen in December. So does Christmas. We are a family that celebrates Christmas, so I tend to be ridiculously busy in December. There’s the shopping and the baking and the decorating and the wrapping. There are chorale concerts, the ones I love the most and look forward to all year. 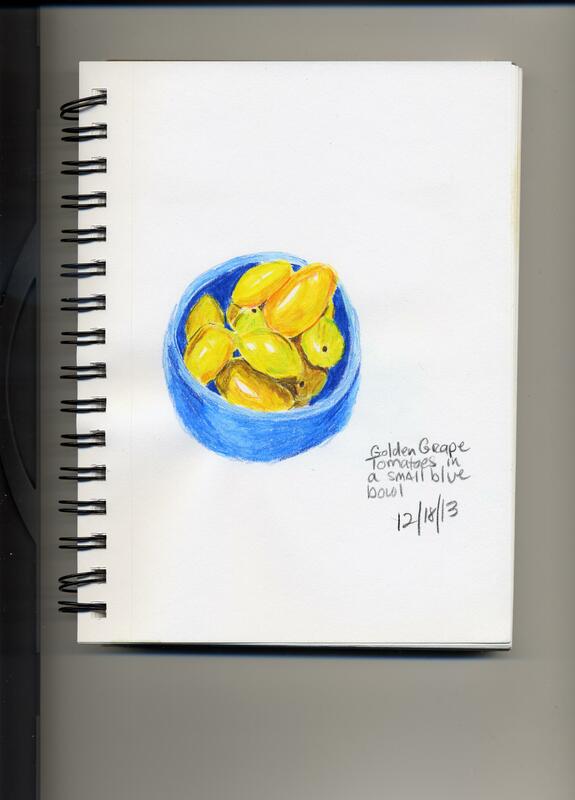 I am beginning to be afraid I will find myself trying to paint every day in January. January, even in Florida, is a cold month. 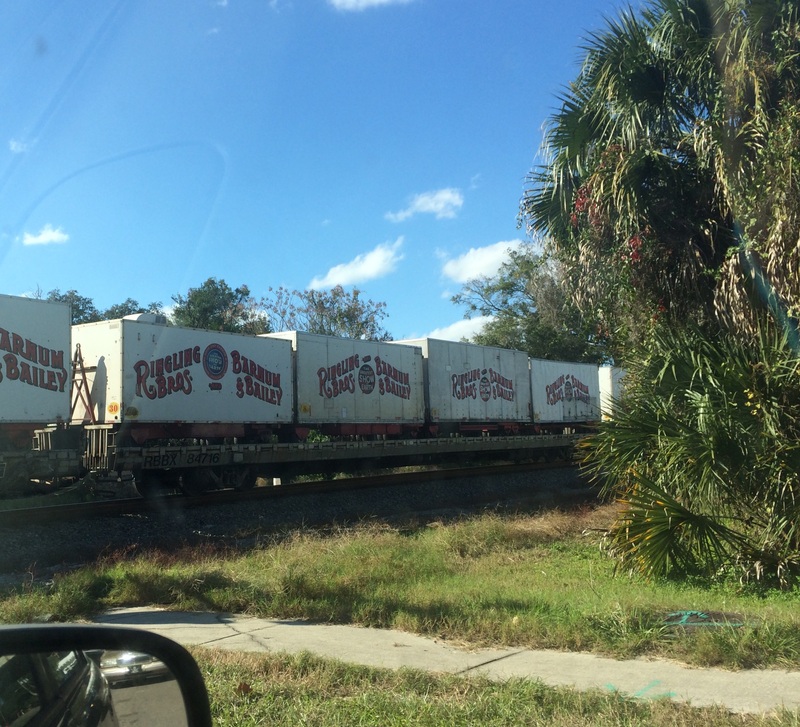 I live in North Florida, so we get honest-to-goodness freezes in January. Some days will be balmy, but most will be cold or, at least, chilly. I knew this was a real possibility when I set the goal, but I hoped the possibility would motivate me to paint more often during the year. I didn’t expect taking my paints outdoors to be so much more intimidating than painting in my dining room. The paints dry faster outdoors. Bugs fly into them. The wind might blow the canvas off the easel. I need to be able to choose pretty days for this, but I have procrastinated myself into a corner and now I will have to take whatever days come. Trial by fire. Trial by ice. I brought this upon myself and I will see it through, but there is one special thing this month that will help me work up to it. 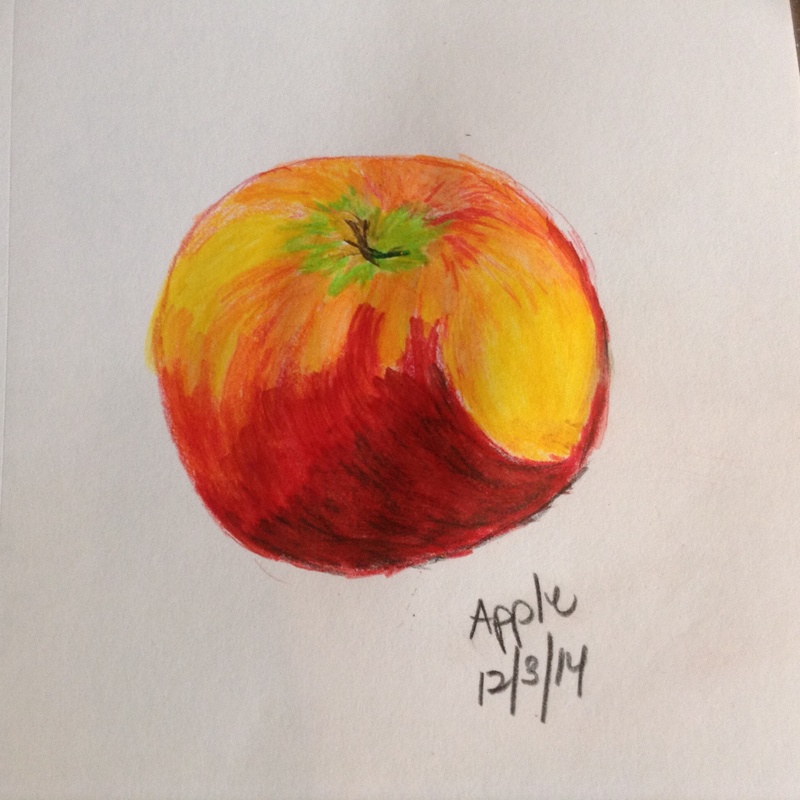 Every December, my niece, Grace, invites me to participate in her Sketch-a-Day Challenge. 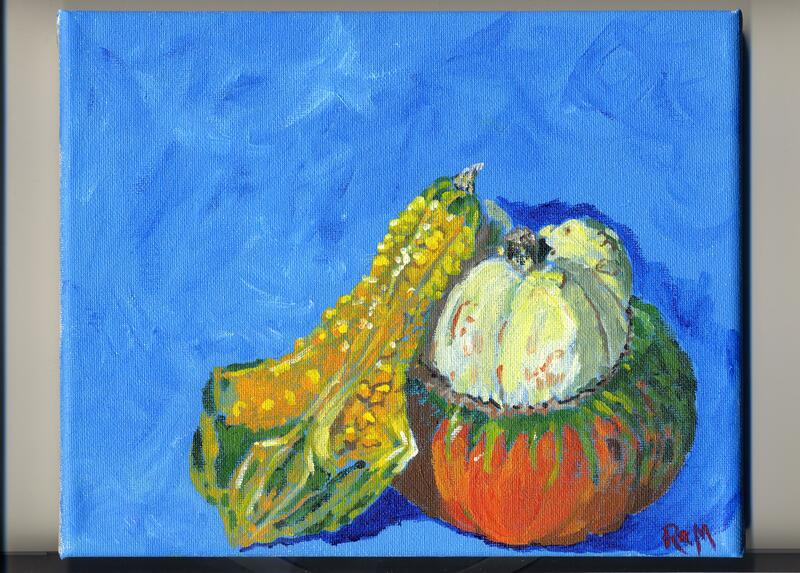 When I think of forty plein air paintings by February, that seems daunting. 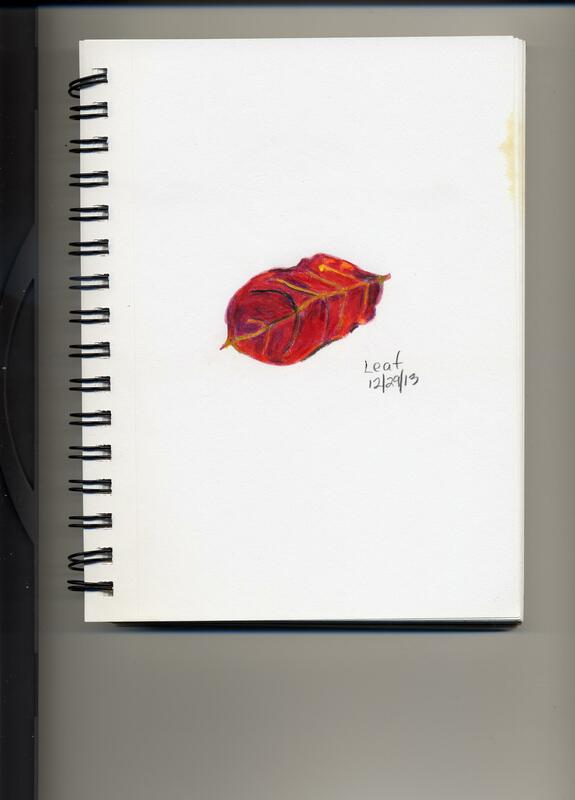 One sketch each day in December seems much more manageable. It’s a commitment I have made for the past two years and I found that it gave me a nice little break, each day, from the hustle and bustle of the holiday season. I do simple drawings so my inner critic stays quiet, and I give myself permission to do them badly. 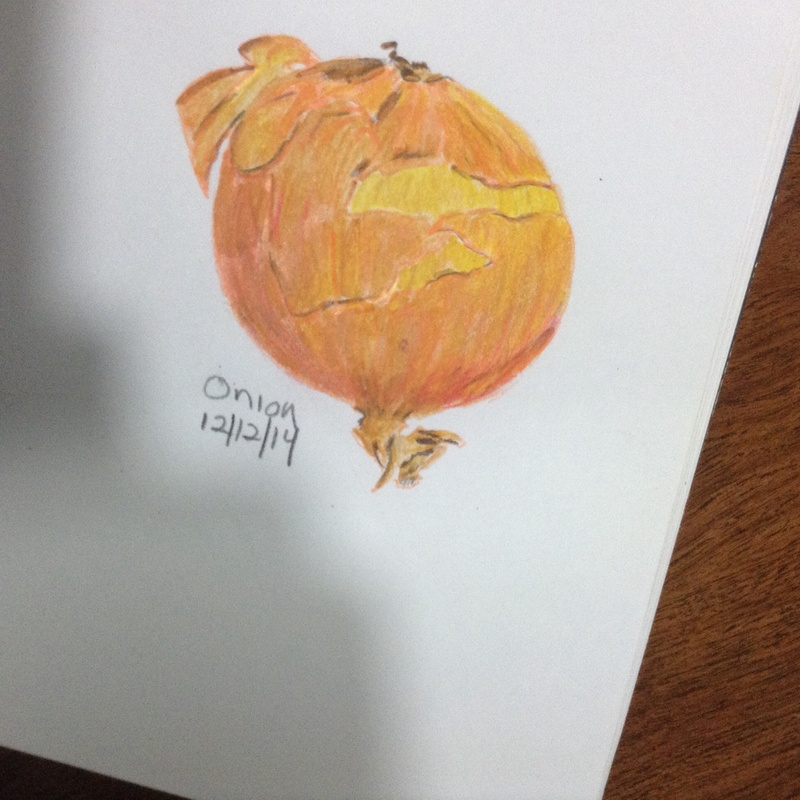 Today is the second day of December, so I have done two drawings. These have reminded me that I love drawing and I love color. They give me hope that I will find my way back to painting. Meanwhile, I need to go shopping for some round fruit. 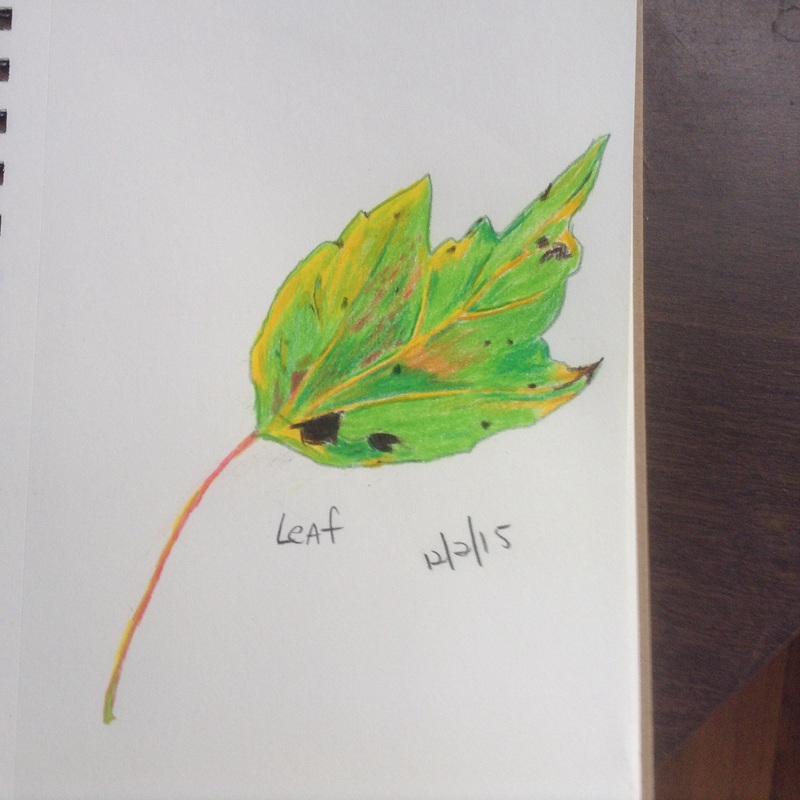 I’m going to get tired of drawing the leaves I find in my front yard. 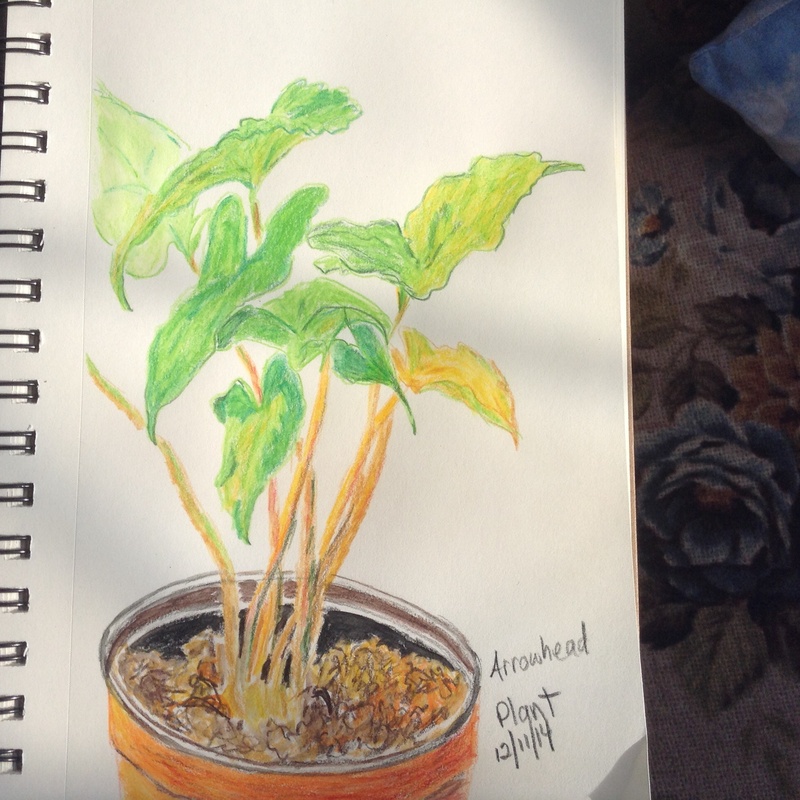 This entry was posted in Uncategorized and tagged drawing, painting, procrastination, sketch-a-day challenge on December 2, 2015 by releaf1954. I was so busy last week making pies and posting about making pies that I forgot to mention a couple of other things that happened between that post and the one before it. The first was that I won NaNoWriMo. I wrote fifty thousand words. They’re not very coherent words, but there are fifty thousand of them and I wrote them all myself, so they count. The other was that I painted. If you were looking closely at the “before” picture of my table in last week’s post, you saw my painting. I still want to share it in close-up here so I can count it. My friend, Sarah, of Full-Time Writer Mom, gave me the gourd and I picked up the turban squash on clearance because I thought the gourd needed a friend for support. Literally. 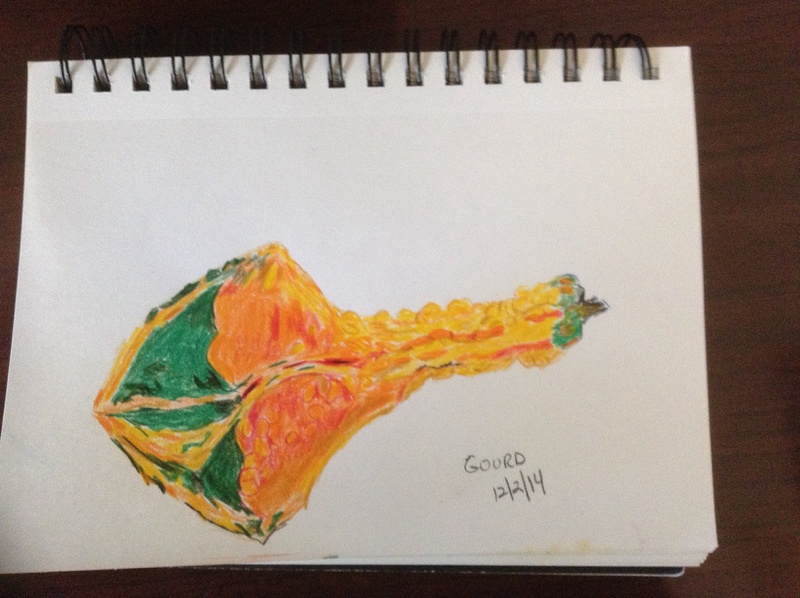 The squash was a whole lot easier to paint than the gourd. I let all the little bumps intimidate me, so the basic shape is a bit off, but I still had a good time painting it and that’s what matters. I’ve joined a new challenge for December. 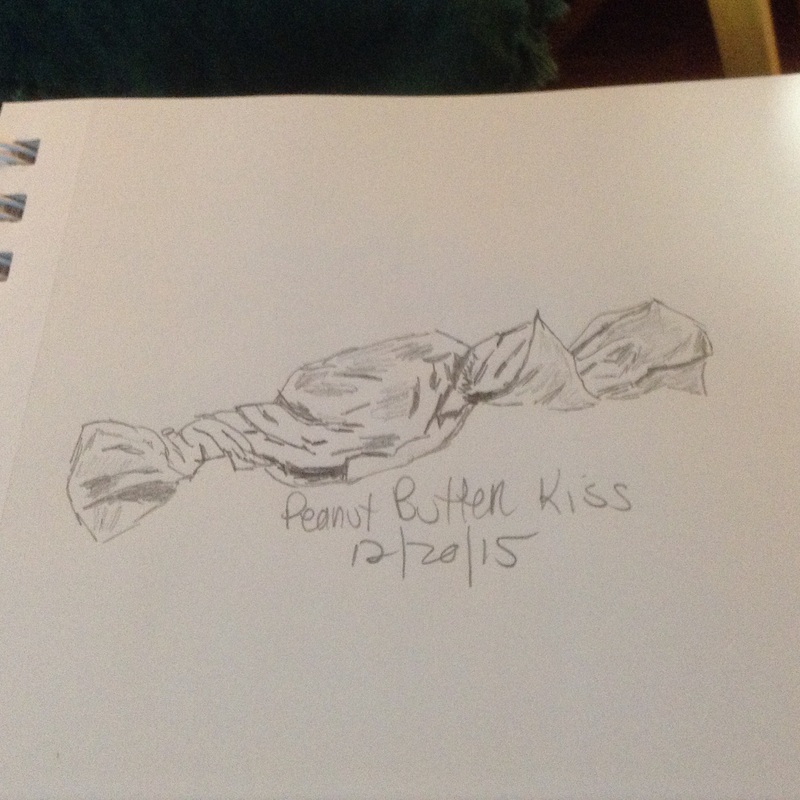 This one comes from my niece, Grace, and it’s a “sketch-a-day” challenge. I don’t think I’ll be sharing all of my daily sketches in my blog, but here are the first three so you can see how it’s going. 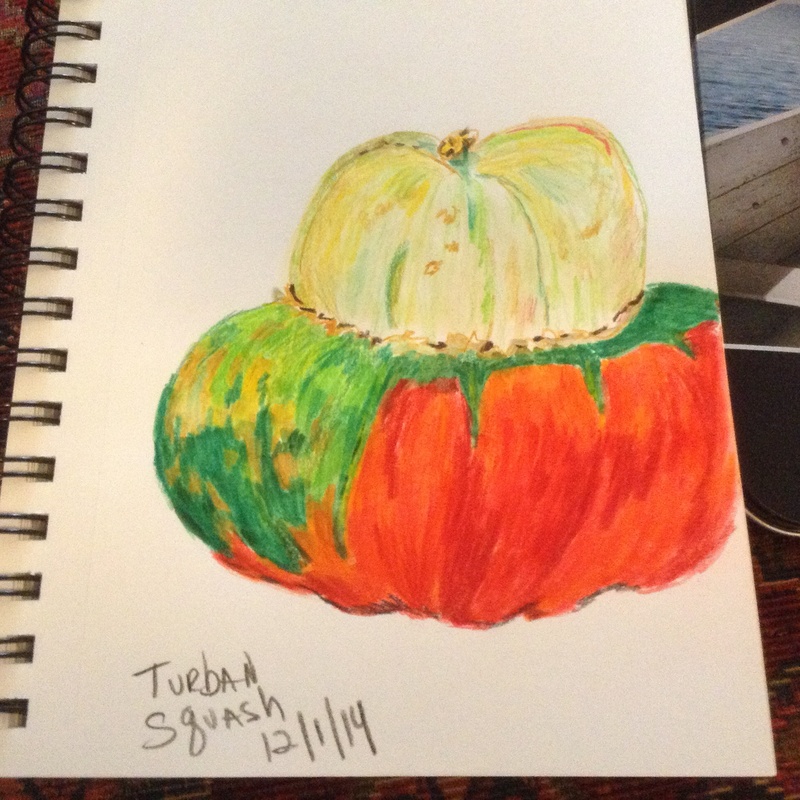 I made use of the turban squash for my first sketch and the gourd for my second. 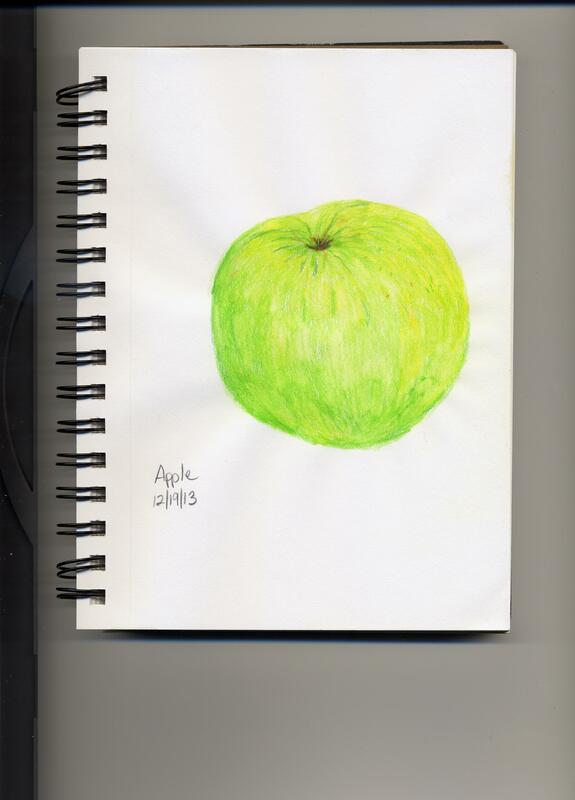 My third is of an apple from my refrigerator. 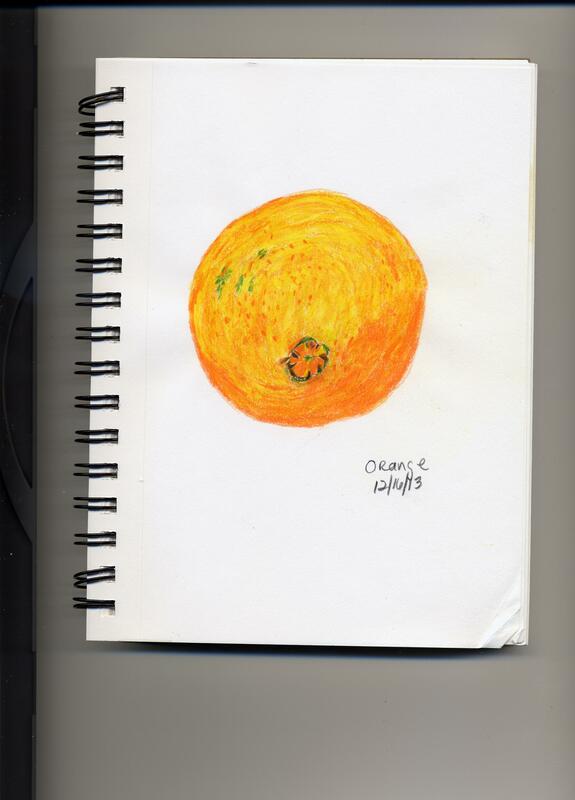 So far, my theme appears to be “Fruits and Vegetables Floating in Space.” For me, the sketch-a-day challenge is not about creating great art, it’s about presence and commitment. 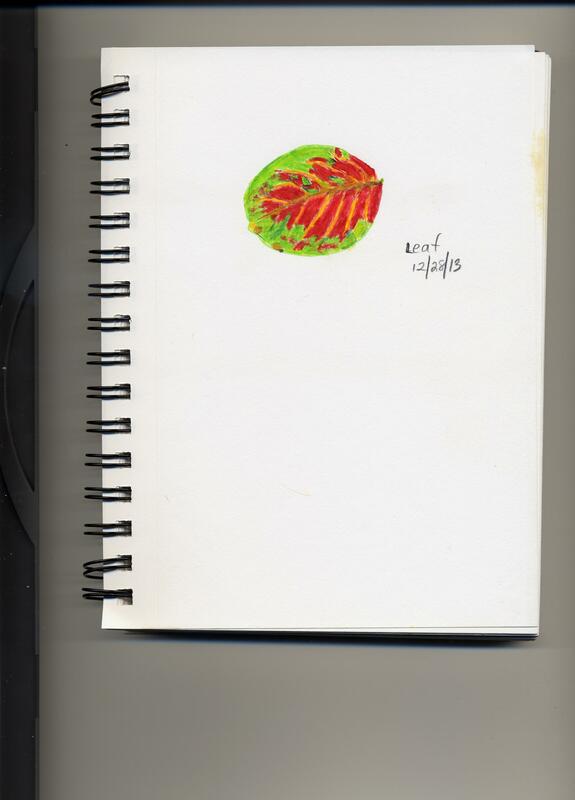 Drawing something – anything – is a way to bring myself into the here and now. It improves my mood and makes my whole day a better day. I’m looking forward to lots of good days in December. 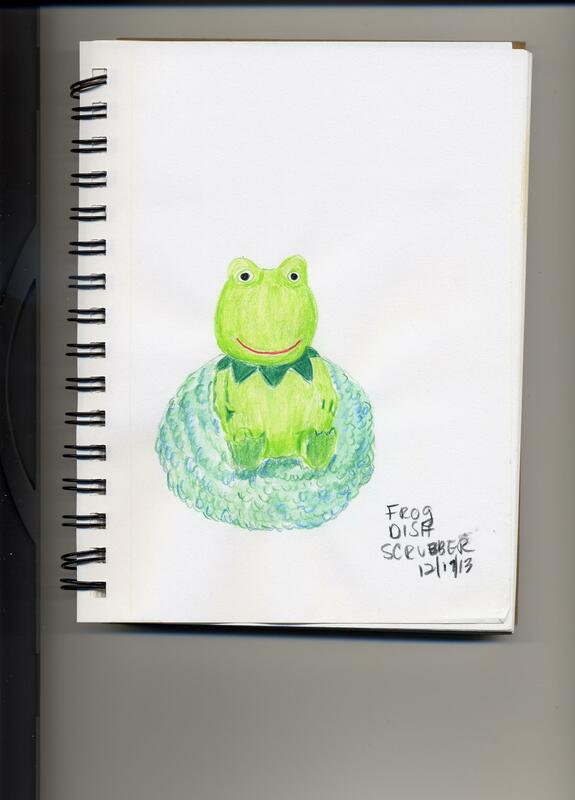 They will be crazy busy, of course, but if I manage a sketch every day, there will be a small oasis of peace in each one of those crazy busy days. I’m ready to show up for that. 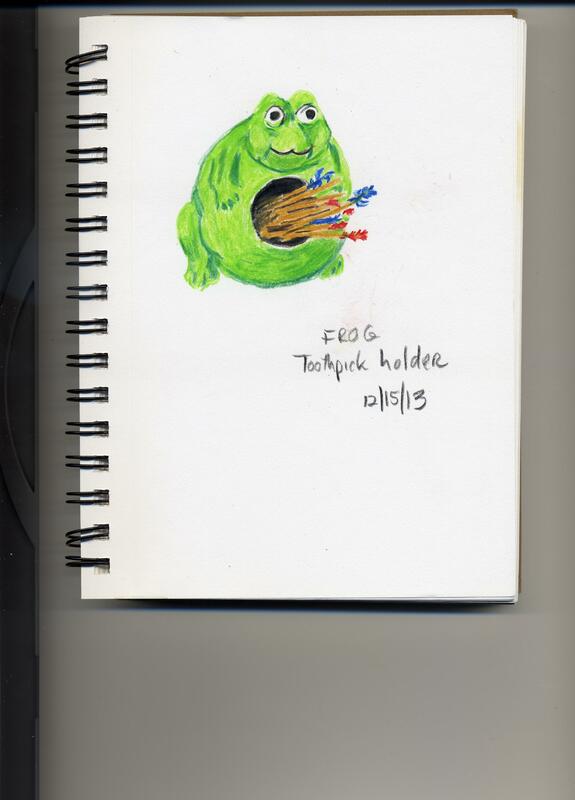 This entry was posted in Uncategorized and tagged challenges, drawing, NaNoWriMo, painting, sketching on December 3, 2014 by releaf1954. 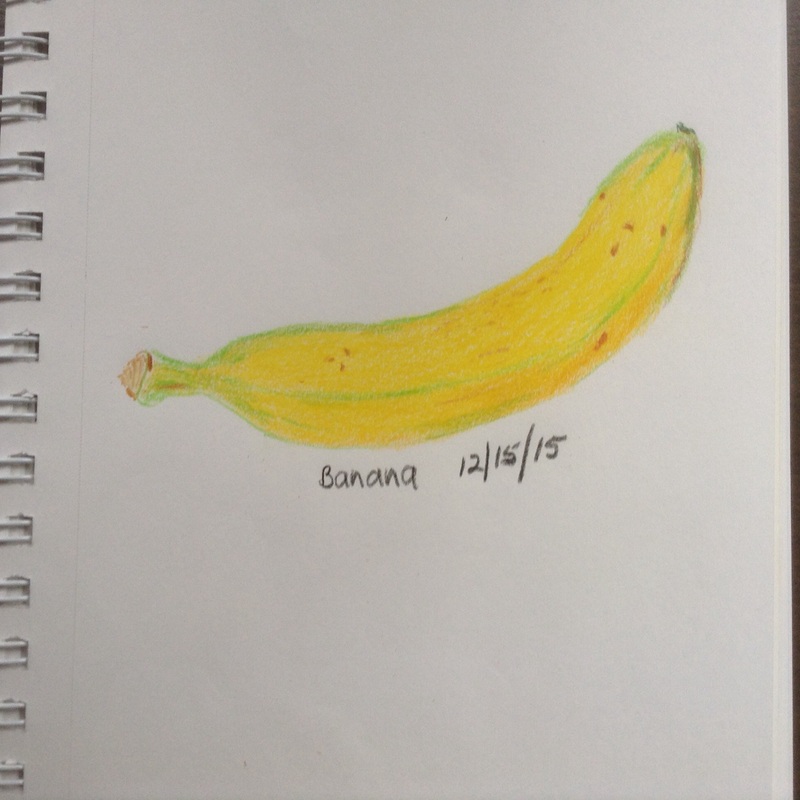 I have finished the December drawing challenge. 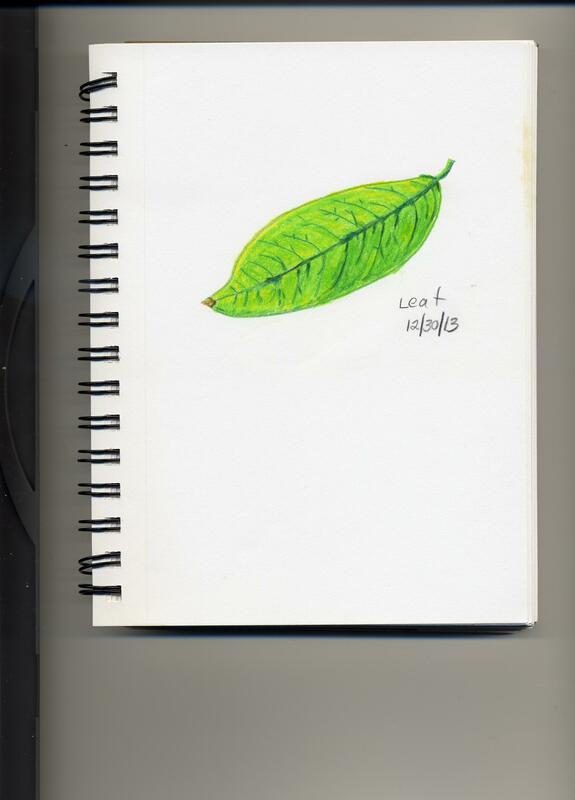 Leaves were working for me and December is the time when the leaves turn and fall in Florida, so I figured I would finish out the month with leaf drawings. Last Saturday, my husband and I went on an afternoon walk around our neighborhood and I watched for pretty leaves on the ground as we walked. 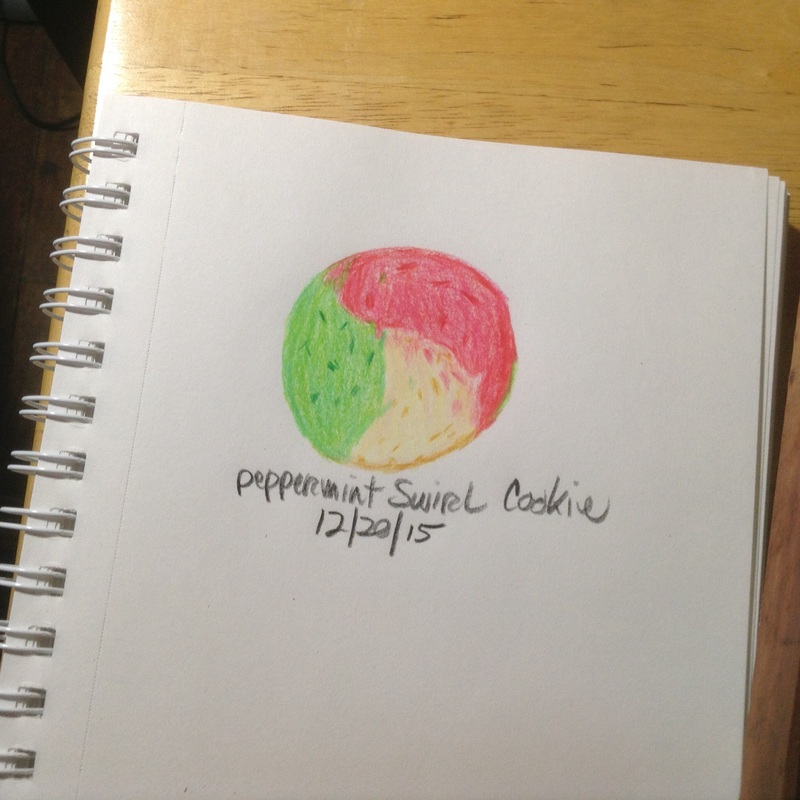 That’s how I found the red, green and yellow one I drew on December twenty-eighth. The bright red one I drew on the twenty-ninth was also found on that walk. 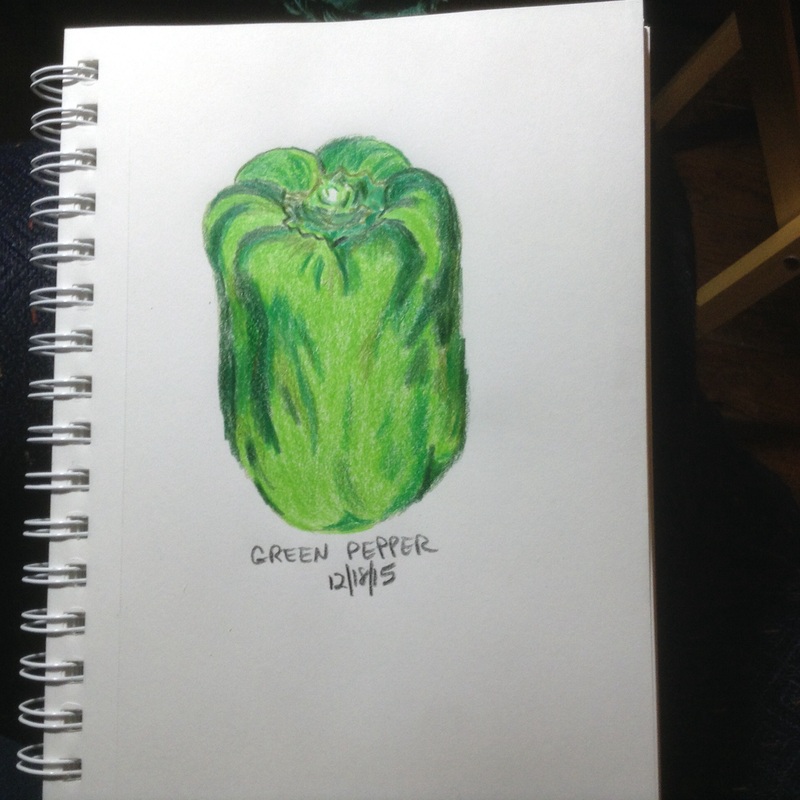 On the thirtieth, I pulled a green one from a plant in my back yard. 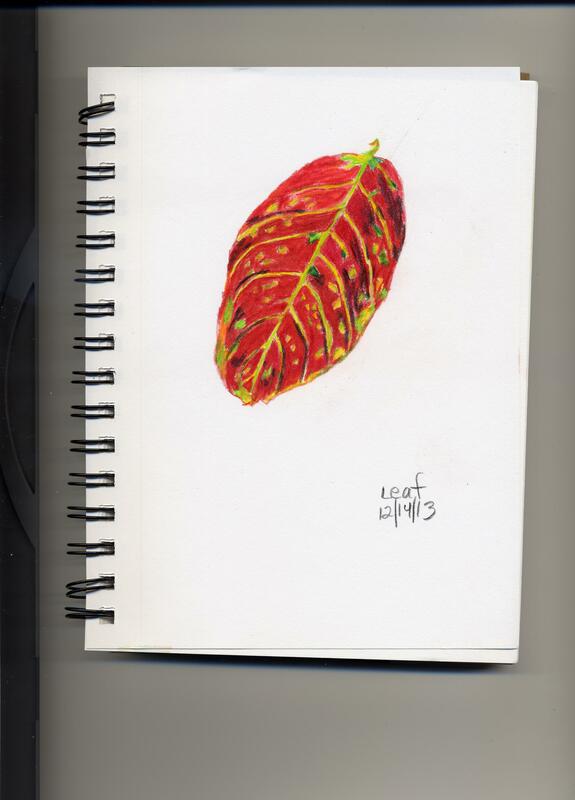 The next day was the last day of the challenge and I thought I would find another leaf to draw, but then I realized I was tired of drawing leaves and I looked around for an alternative. My eye fell on our Christmas tree, a fat and fluffy white pine that was probably the most perfectly shaped tree we have ever had. The perfection was broken only by a single branch, which stuck straight up while the branches all around it bent gracefully towards the floor in a smooth, symmetrical cone. I had put a single red ball on that branch. 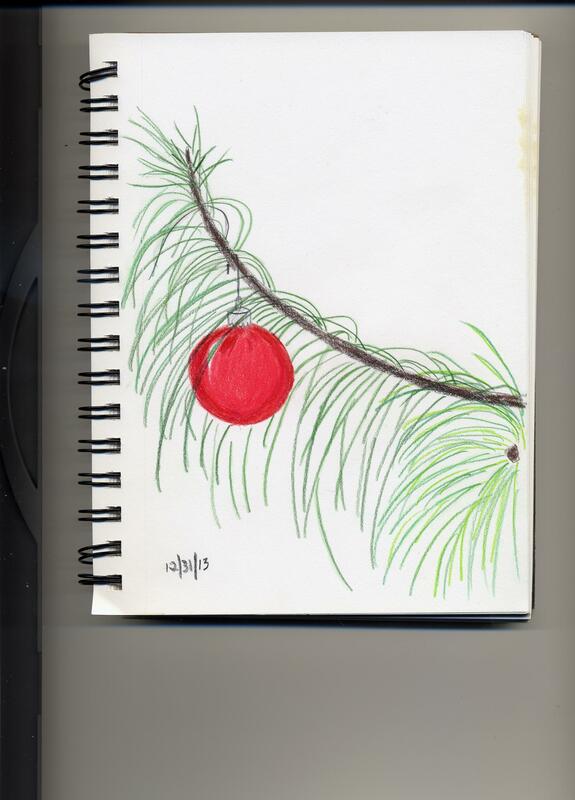 When I saw it on New Year’s Eve, it reminded me of the adorable little tree in the Charlie Brown Christmas special and I decided to draw that instead of a leaf. Now the December challenge has been met and I’m closing in on another challenge. My List of Fifty Things is up to forty-nine. My sixtieth birthday is still a month away and, thanks to my niece and her drawing challenge, all I need to think about now are the Big Three. I said when I started this blog that I wanted to do fifty creative things before my sixtieth birthday and they had to include an art quilt, an art doll and a 16” x 20” painting. The idea was that I would be working on those three things throughout the year, while I also did other, smaller creative things. Of course that was the idea, but I’m not at all surprised that I’m down to just a few weeks and I haven’t done a single one of the Big Three. It’s more surprising to me that I actually have forty-nine things on my List of Fifty Things. 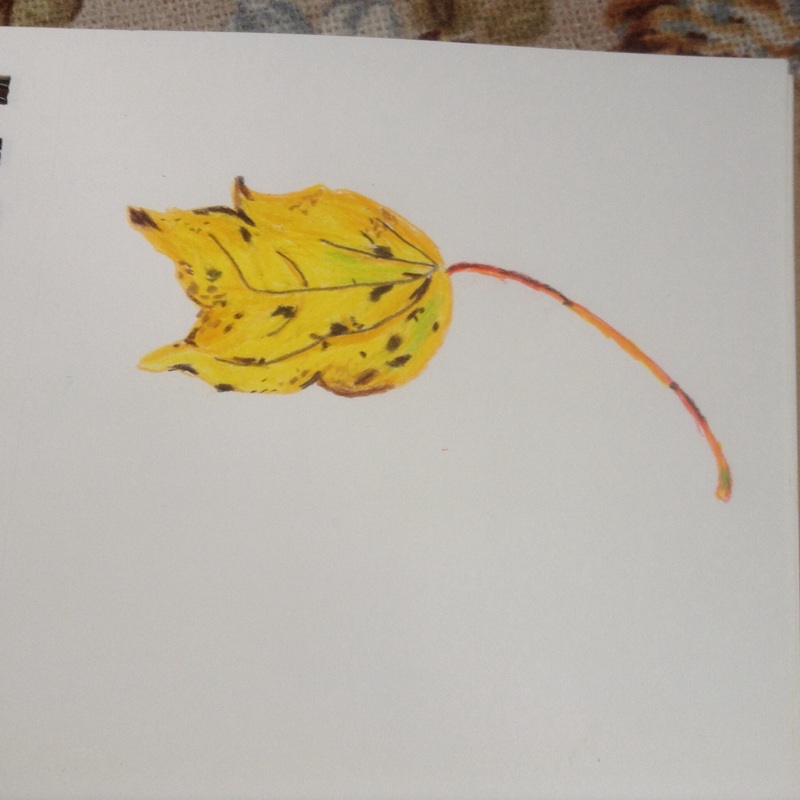 I was completely stuck and I was doing mostly nothing when I started this blog and challenged myself to do fifty creative things in my sixtieth year. I’m pleased with where I am at this point and still absolutely determined to finish the challenge before February eighth. 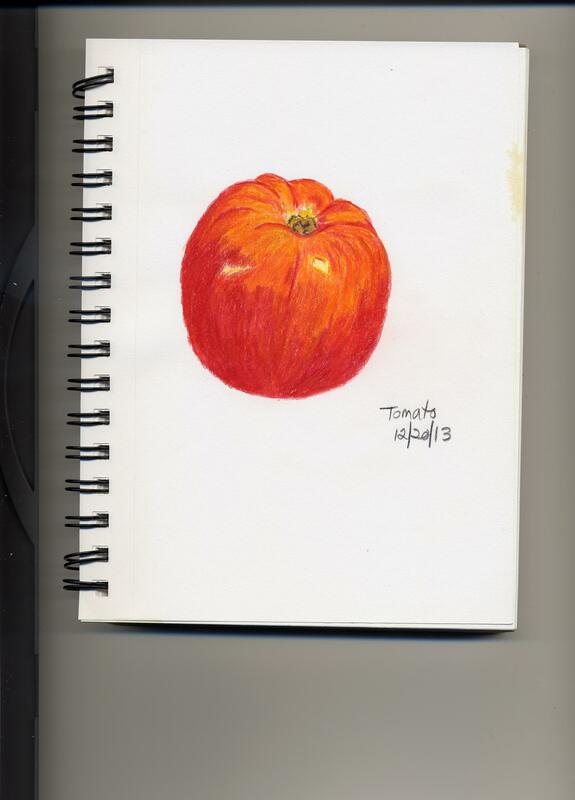 Thank you, Grace Makley, for setting up the sketch-a-day challenge that brought my list to forty-nine. Now that my milestone birthday is breathing down my neck, I will be putting my attention into the Big Three. I do love a deadline. 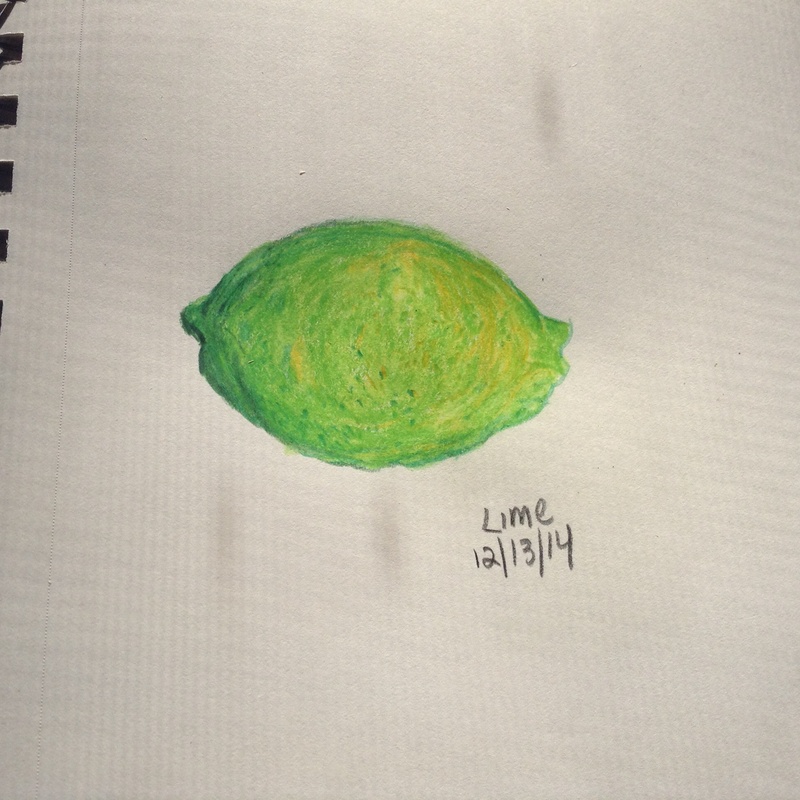 This entry was posted in Uncategorized and tagged creativity, drawing, sketching on January 3, 2014 by releaf1954.